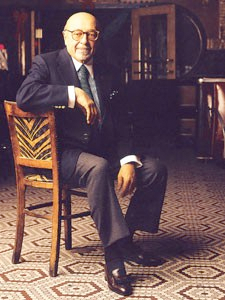 Established by The American Turkish Society in 2007 in memory of Ahmet Ertegun, founder of Atlantic Records and long-time chairman of The Society, the Ahmet Ertegun Memorial Scholarship supports talented musicians of Turkish descent in their studies at The Juilliard School in New York City. The scholarship continues Mr. Ertegun’s legacy of promoting talented artists while contributing to greater cultural understanding between the United States and Turkey. The qualifications require the student to be of Turkish descent. Students of Turkish heritage who have been accepted to The Juilliard School will be considered for the Scholarship by Juilliard’s Financial Aid Committee. Founded as the Institute of Musical Art in 1905, The Juilliard School is the leading institution in performing arts. Located at the Lincoln Center for the Performing Arts, The Juilliard School welcomes applications from qualified students from anywhere in the world. The Ahmet Ertegun Memorial Scholarship recipients are selected by The Juilliard School. Only students admitted to the school are eligible for consideration for the scholarship.